You can read our Google Drive integration article to learn how to share files with your team on Azendoo. If you have multiple Google accounts you'll be prompted to choose which one you want o use. A summary of the required permissions is then displayed to you. These permissions allow us to provide you with the list of your contacts or documents, and perform searches when you have a Google session open. i.e. only you can use your own permissions when you are connected on Azendoo and are also authenticated to your Google account. How to invite people from my Google account? First go to the Workspace invitation window by clicking on the + next to the Workspace members. Then click on the email address field. If you haven’t already done so, you can connect your Azendoo and Google accounts now. Once the accounts are connected, simply start typing a name or email address to see the results from your Google contacts display. Click on the contact, or use the keyboard arrows and enter, to select the contact you want to send the invitation to, and hit the send button on the bottom right of the invitation window. How to switch/change Google accounts? If you signed up with Google you need to create a password for your Azendoo account as it does not yet have one. connect to https://app.azendoo.com/#settings/authorizations using your email address and your password. 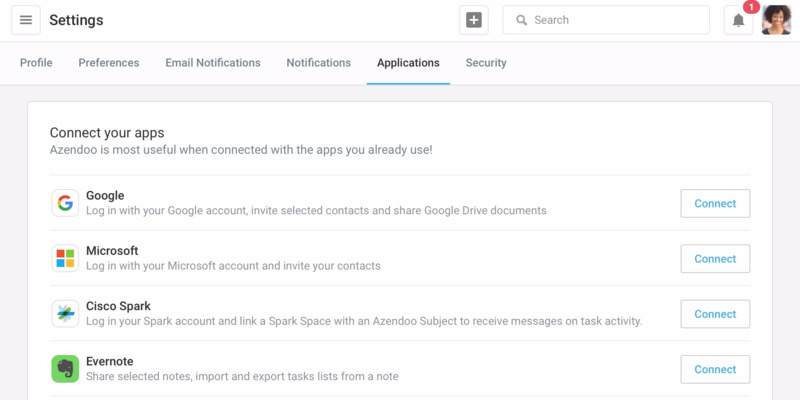 You would like to benefit from Google Drive integration within Azendoo but you don't want to create a Google email address? (for ex. get a Google Account on a xyz@company.com or tom@yahoo.com email address). Of course, we never want to see you leave, but if you ever want to disconnect Azendoo's access to your Google account, you can easily do so. If you created your account using your Google account please make sure to create a password for your Azendoo account to access it after the following steps. From your azendoo account, go to https://app.azendoo.com/#settings/authorizations and remove Google. - Then, you can login to Google in your web browser. - Under "Authorized Access to your Google Account"Connected Sites, Apps, and Services" find every instance of "Azendoo"
- Click the "Revoke Access" button for each instance of Azendoo. This unauthorizes Azendoo to access your Google account.